Tribals Rugs by Hand, a small boutique-style store, is unique in providing stunning tribal rugs that successfully join the elements of any room together; wheter a casual living area, cozy bedroom or farm kitchen. The reason for this is obvious when you meet owner Michaela Chelminski, who says "I love sharing my passion for these rugs with my customers." Tribals opened in December 2005. It began with a showing of personal rugs belonging to the owner that she collected over 30 years. A few rugs are antiques some are old, some are new. Many of the tribal rugs are made by nomadic people for their own use, using local handspun wool. These village, tribal and oriental rugs display facinating patterns and vivid color at a significant savings over traditional oriental styles. They now come from Persia, Afghanistan, Tajikistan, Uzbekistan and other small countries on the southern border of Russia. A visit to Tribals, Rugs by Hand in Peterborough's Depot Square reveals an artful atmosphere where tribal and village rugs are explained and presented with personal attention. 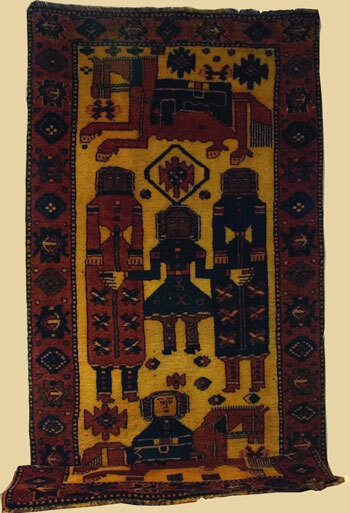 The vegetable-dyed rugs, hand-knotted on horizonal looms and worked on the ground are offered in several sizes including traditional prayer rugs. Visitors will also find "balisht" or bed bags from Afghanistan, used to transport personal items upon a horse or camel. There are even "camel trappings", (narrow, decorative rugs with long, colorful tassels used for adornment) that make for stunning wall hangings. Whatever the style, dimension or intended purpose, tribal and village rugs offer a great alternative to pricey orientals. They are distinct, colorful and versatile, just like the people who have created them for hundreds of years. Chelminski is also known by residents as the owner and instructor at the Peterborough Art Academy & Gallery, which shares its space with the rug shop. She utilizes elements of both businesses together, displaying the rugs alongside works by local artists she represents through the art gallery, to create an initial impression that is both homey and elegant, which is apparent as soon as you walk in the door. Legal and Privacy Copyright © 2008, 2019 Tribals, Rugs by Hand, All Rights Reserved.